Progress on Peacock Feather today. When Rodney gave me his critique this afternoon he pointed out her eyes were a little crossed! That can be corrected tomorrow. Also will finish doing the skin tones and shadowing on the shoulders and arm. Then the work will need to dry for at least 4, maybe 7 days? before I can tackle the really challenging task of embroidering the peacock feather she holds over her face, see the original photo in yesterdays blog below if you don't know what I refer to in regard to the feather. The 2 blue slashes on her right jaw relate to the shadow cast by the peacock feather. 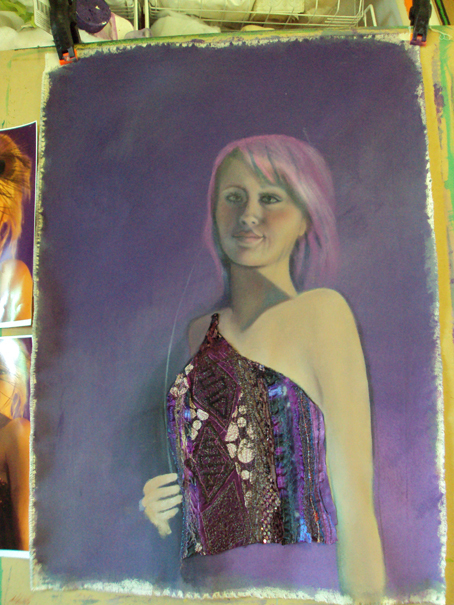 It will be more practical to finish painting that shadowing once the embroidery is completed. I did some applique and machine embroidering to create the dress textile. It is just crudely tacked on over the torso at the moment. It has to be left until the paintwork is dry so I can do some more machine embroidery into it. 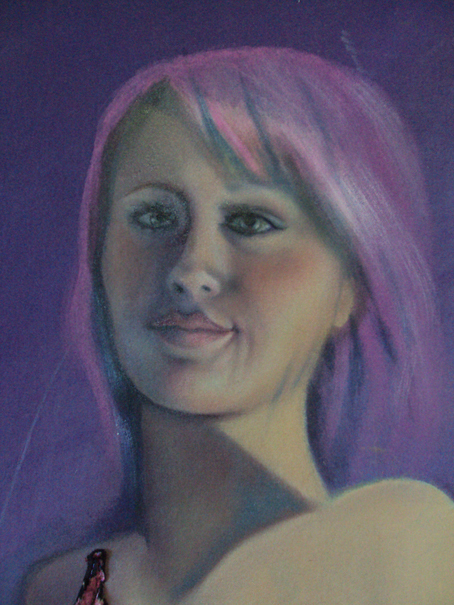 I think I will leave the hair pink, though in the photo the model is blonde.